We at Collaborate Architecture understand that pricing is always an important factor of the design process. When it comes to pricing an unknown design, it is almost impossible to predict the exact cost of the entire project. In order to accommodate this uncertainty, we offer three pricing methods as well as phase flexibility to fit the project budget. 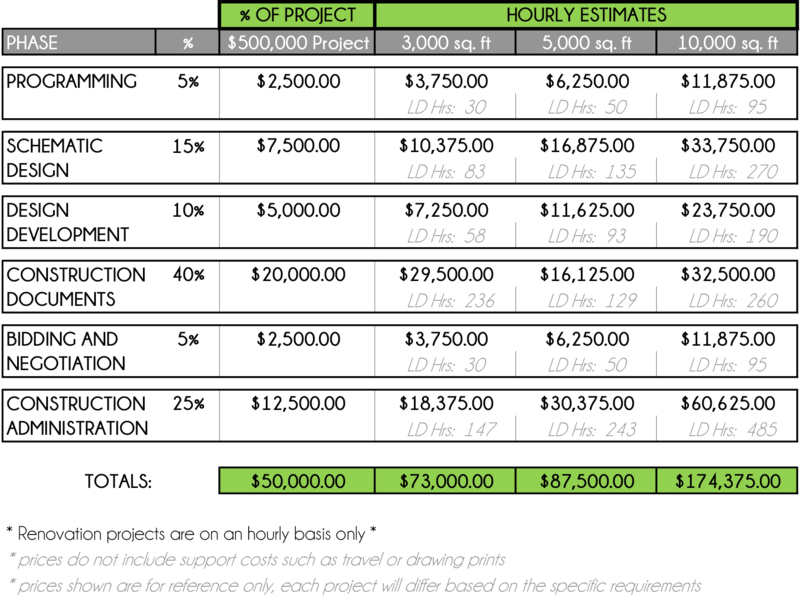 For select project phases, a fixed cost fee is available. Shown below is a sample comparison between the Percentage of Project Cost and Hourly Fee pricing methods. Please keep in mind that phases can be removed and the scope of work can be adapted to meet a variety of budgets. Set up a meeting to discuss the best options for your design.